We arrived at the trailhead in between rain showers. As soon as I had Kellisa in her Hippocampe and we were ready to start, it began to rain again. We took shelter in the Jeep and I worried about losing our chance to pushike this trail. I had selected the Limberlost because it was accessible (rare in mountain environments), 1.3 miles long, had a bridge and boardwalk. After a long 30 minutes, the rain stopped. I had to reload Kellisa in her chair before we could start out on the trail. I had checked the weather the day before and there was a zero percent chance of rain, so I didn't pack our raincoats (rookie mistake). Laurel did not enjoy all the bug sounds coming from the forest. She used the hood on her hiking shirt to block out some of the buzzing. 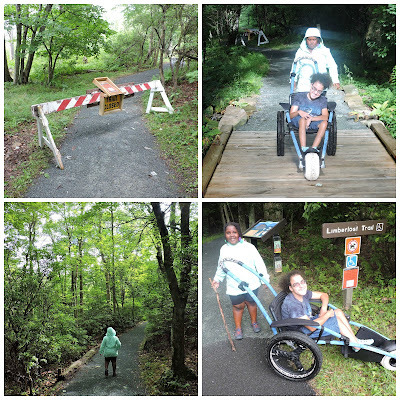 The trail was in great shape and we found it to be very accessible until we reached a barricade. The trail was closed after .51 of a mile. It was a pleasant stroll through the forest with a few slight elevation changes. It would have been nice to complete the trail. 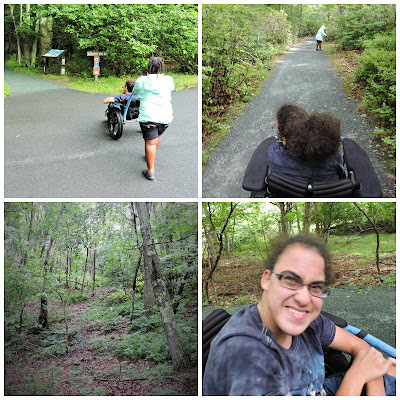 Before returning to the trailhead, we did explore a little side trail that wasn't accessible.